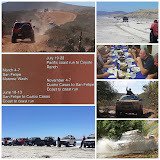 Join us for a fun filled weekend on the beautiful Pacific side of Northern Baja. Arrive at Cuatro Casas Hostel Friday afternoon. We will greet you with some hot street tacos and a cold beer or 3. Saturday we load up and guide you on a bit of the Baja 500 race course. Up to the beach where we spend some time running along the ocean right on the sand We have trail lunch of simple cold cut sandwiches. We also play in the dunes. We trail run up along more of the Baja 1000 racecourse then late afternoon we end up back at Cuatro Casas for a traditional Mexican fish taco fry with all the trimmings. Then we fiesta the night away with a giant bonfire and lots of fun. Sunday wake up whenever you want and head home.